I have had many questions over the years from folks about which “grip panel” goes on which single action Ruger. 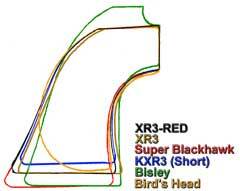 Especially about the difference in the early Single-Sixes and Blackhawk “Flattops” when compared to the later Blackhawks and Single-Sixes, short barreled New Model Super Blackhawks, and on into the New Model Blackhawks, Vaqueros, and Bisley Vaqueros. It can be quite confusing unless you are a student of the subject. 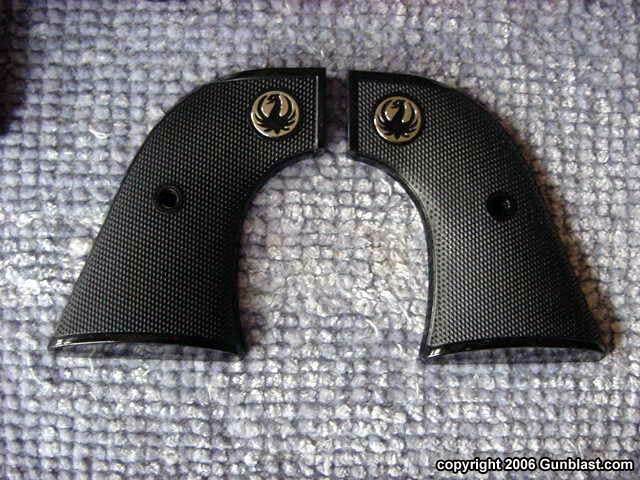 These questions are primarily generated by someone attempting to purchase replacement grips or custom grips for their Ruger single action revolver. Also it may be about a grip frame on an old collectible Ruger that someone is about to lay out a goodly sum of dollars to purchase and they want to make sure the gun is “right”. 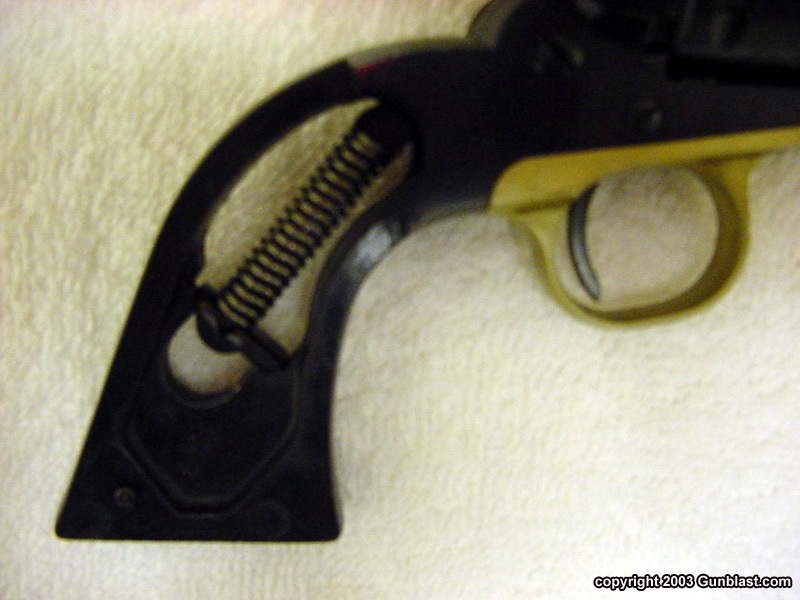 Several months ago a Gunblast reader requested that I provide some information on the different type grip frames that Ruger installed on their single action handguns. I thought this would probably be an interesting subject for others as well and have complied what I believe is a complete listing of the different types used since 1953. I have included the year the specific type was introduced, type of material and finish, grip panel information, and the current production status of each of the grip frames. 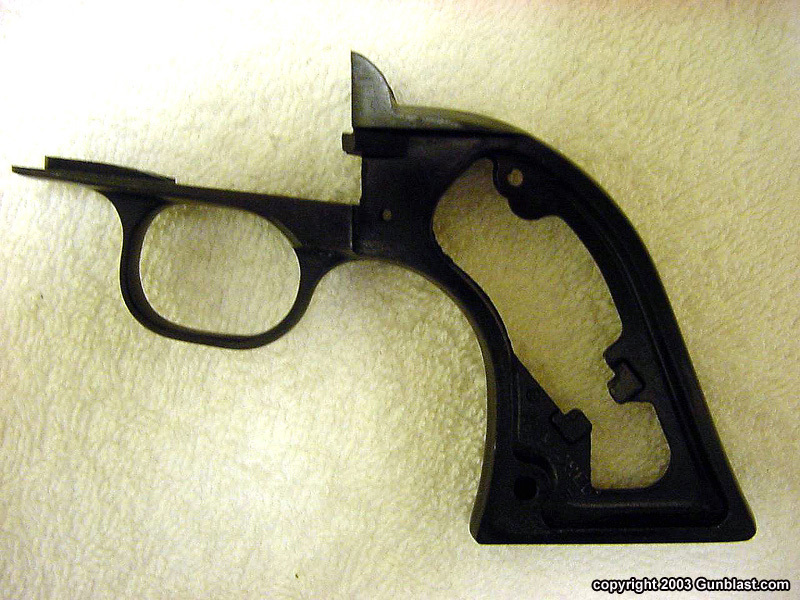 During the research of the different types I was surprised to find out that Ruger has produced fourteen different types of frames since 1953, more than I had first thought. 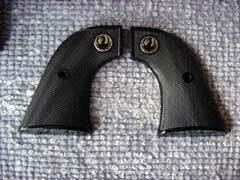 I hope this helps you identify and answer questions that you may have about these grip frames. If anyone has any different observations or comments they will certainly be welcome. 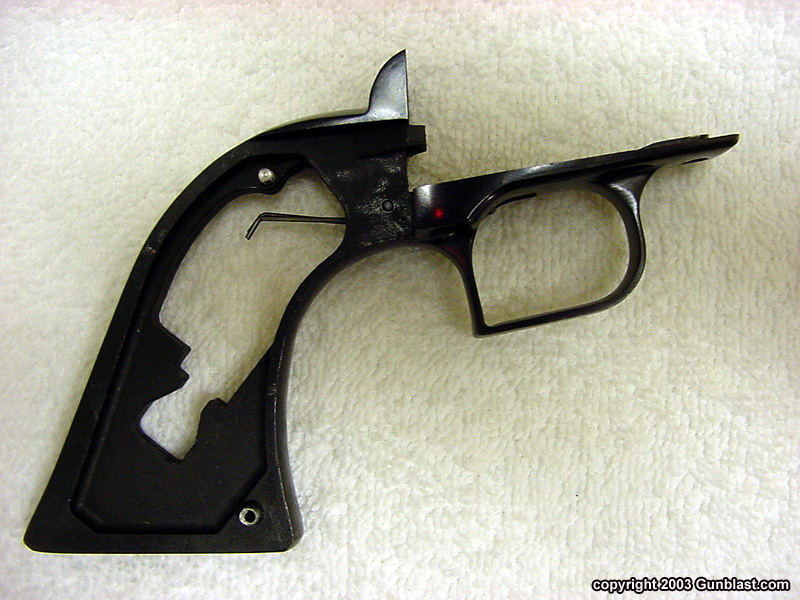 1962/1963 Redesigned and replaced the original 1953 XR3 frame, marked “XR3-RED,” also had the maker, “Alcoa,” on early frames. 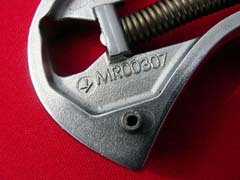 Used on Single-Six, Super Single-Six, Blackhawk, Hawkeye, Old Army. 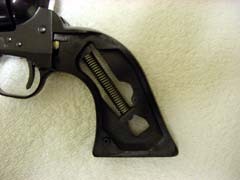 Hawkeye frame had wider trigger slot to accommodate Super Blackhawk trigger. 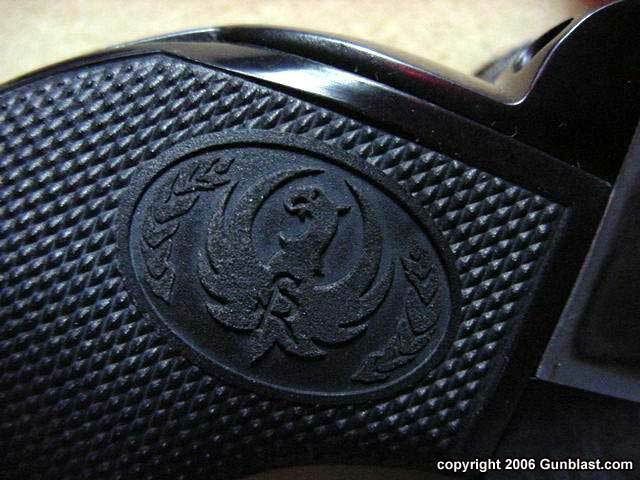 Aluminum alloy, black anodized Varnished Walnut, oil filled Walnut with Black Ruger Eagle medallions. Beginning about mid 1971 the medallions were changed to a flat Silver Eagle. 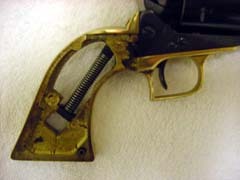 Super Blackhawk Brass “Dragoon” style with square back trigger guard. 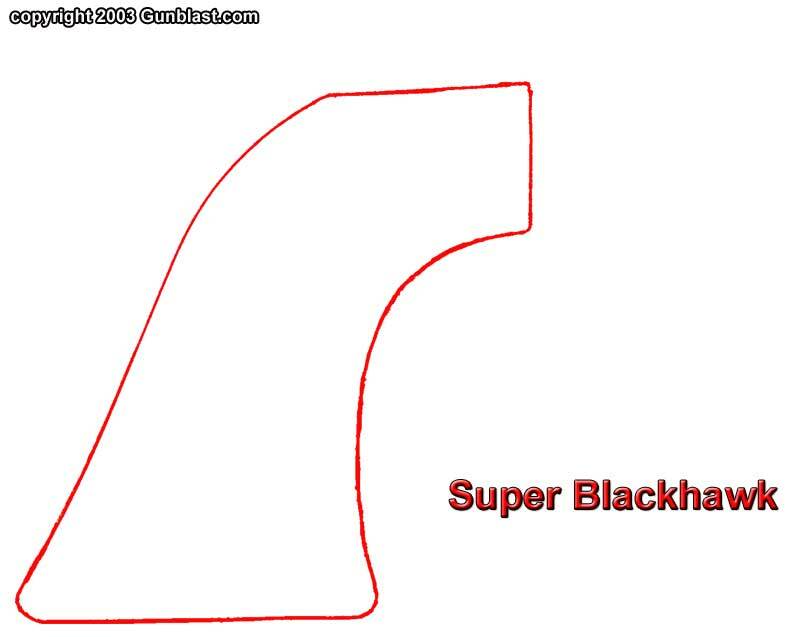 Same dimensions as 1959 Super Blackhawk. Marked “MR-3DB.” Initially for Super Blackhawks, then shipped on various Blackhawks, majority in 1972. 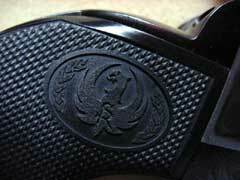 Brass Oil filled Walnut with Black Ruger Eagle medallions or the later flat Silver Eagle. 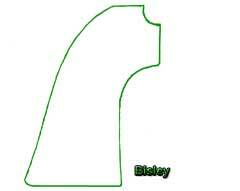 Discontinued 1972/73. In catalog for the Old Army until 1975. 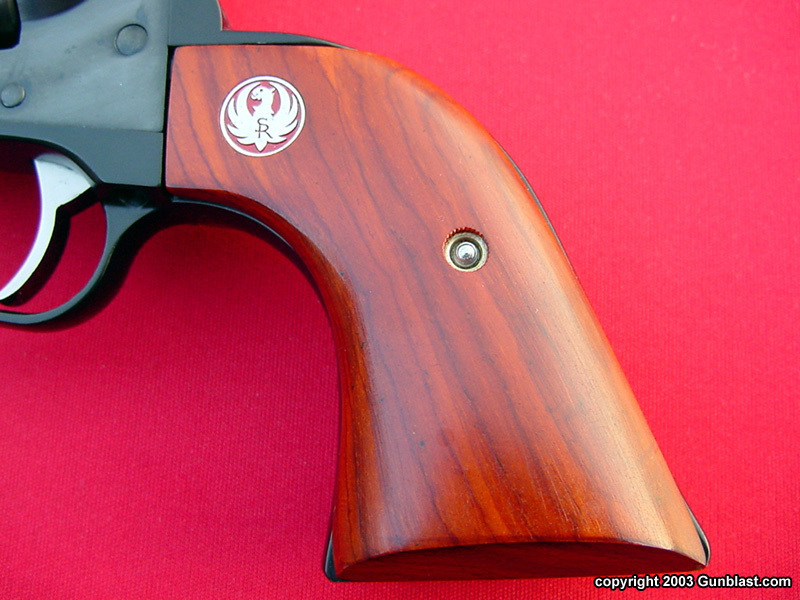 Oil filled Walnut, Goncalo Alves, Rosewood, and simulated Ivory, all with the raised silver with black background Ruger Eagle. Also simulated ivory with scrimshaw black eagle on Sheriff and other special models. 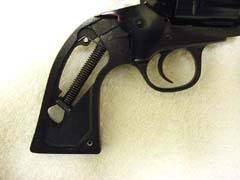 In March 2003 we initially published our article on Ruger Single Action Grip Frames made from 1953 to 2003. 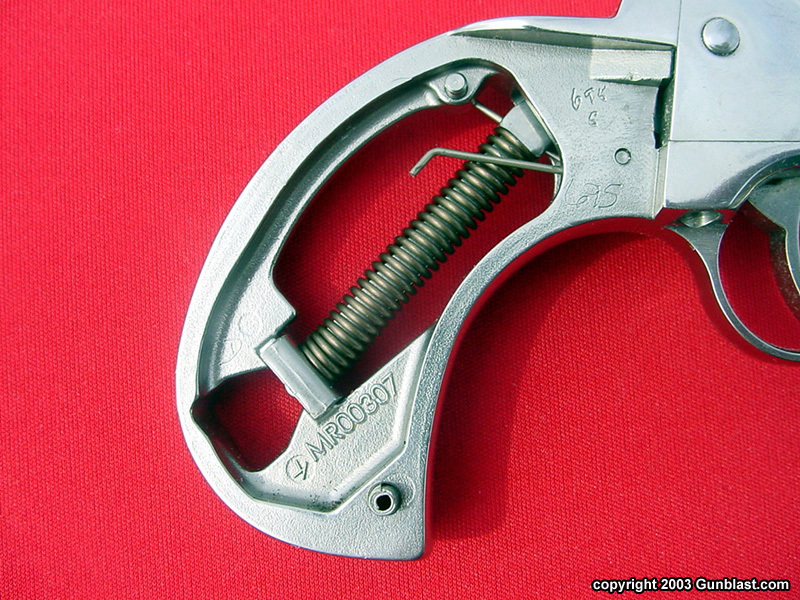 Since that time Ruger has added a new grip frame to its Single Action revolver line. 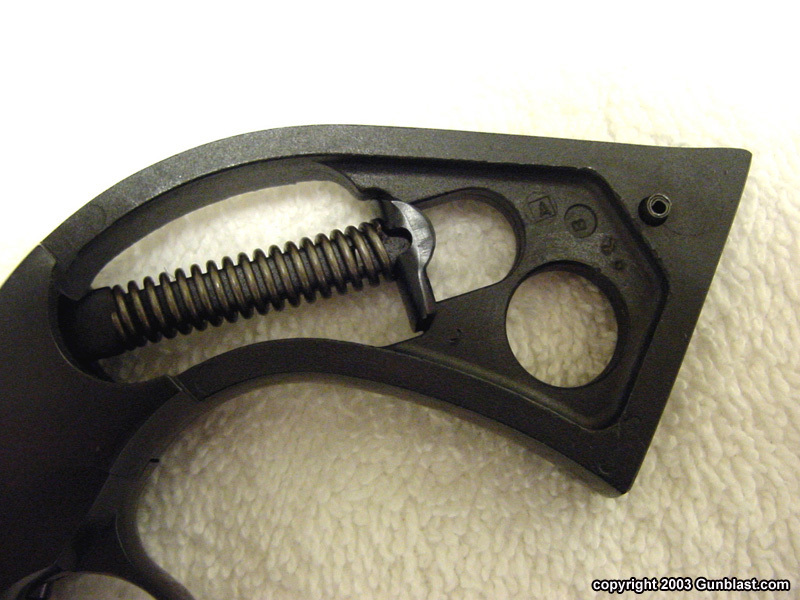 Several Gunblast members have requested information on the new grip frame and grip panels, so this is an update to the original 2003 article. 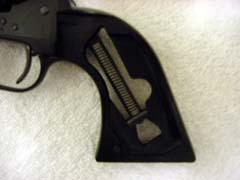 2004/2005 The NEW XR3 style grip frame is very similar to the original Ruger Single Action, Colt SAA style, introduced in 1953. 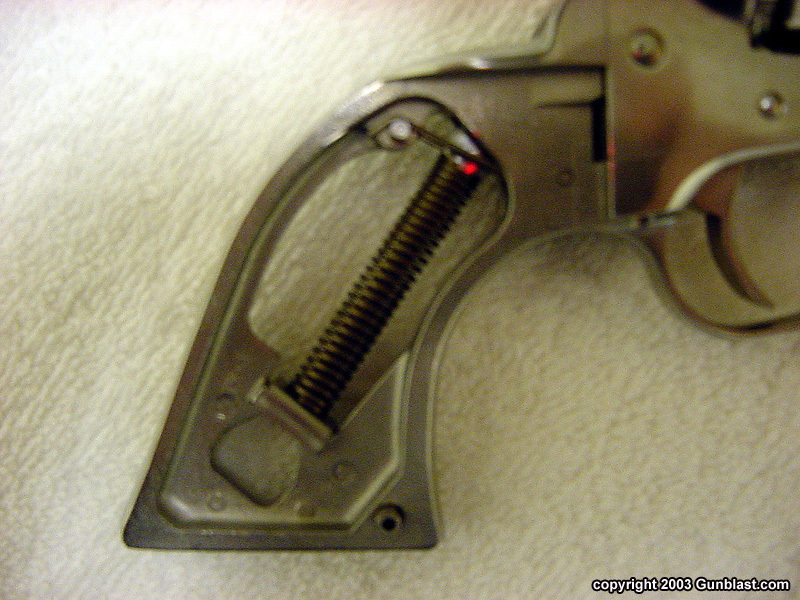 The grip panel locator pin is in a slightly different location from the original, primarily due to the new internal safety lock mechanism. 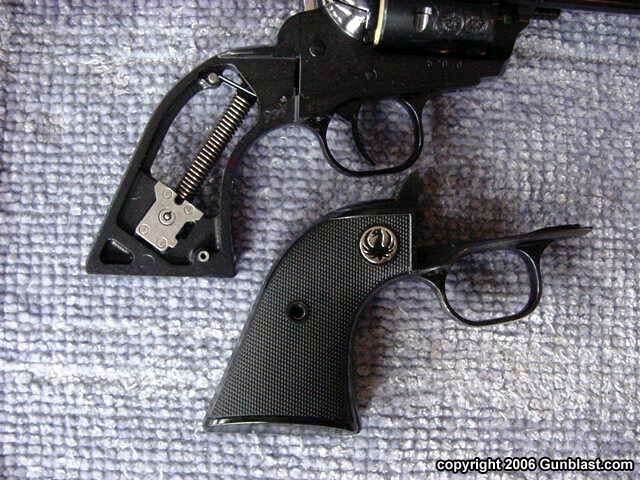 These frames are found on the smaller cylinder framed “New” Vaquero (2004) and the 50th Anniversary .357 Blackhawk “Flattop” (2005). They are also found on the larger cylinder frame 50th Anniversary .44 “Flattop” (2006). Steel/blued or stainless. The interior design accommodates the new internal safety lock mechanism. 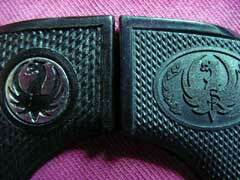 “New” Vaquero – Black hard rubber checkered panels with the Ruger trademark Eagle logo molded into the panel. 50th Anniversary Blackhawk “Flattops” – Black hard rubber checkered panels with the old style post 1966 – 1971 “fat neck” trademark black eagle on silver medallions. 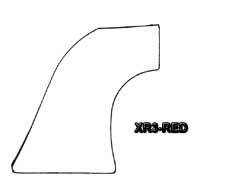 XR3 Grip Panels. Top row from left; checkered black rubber, varnished walnut. 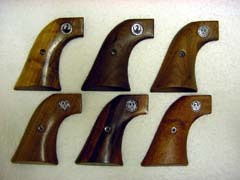 Bottom row from left: factory ivory, factory stag. Left side of XR3 grip frame. 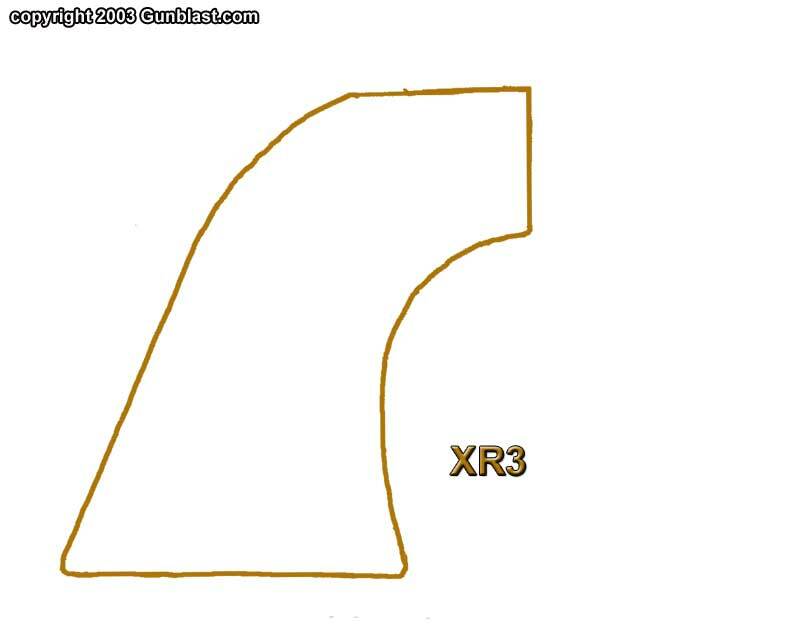 “XR3” mark inside left side at bottom of frame. 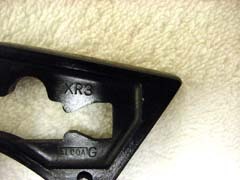 Detail view of the “XR3” size mark and the “Alcoa” makers mark used on early XR3 frames. 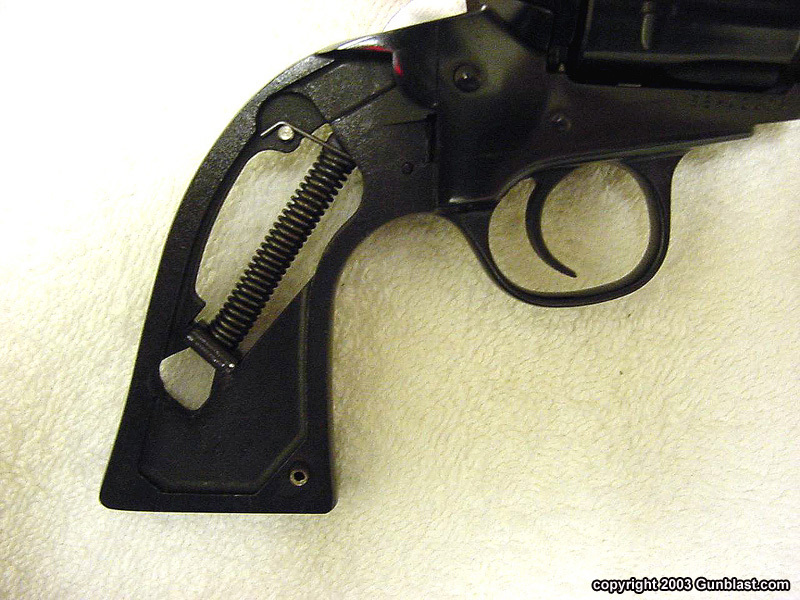 Right side view of the “New” Vaquero grip frame interior with the internal safety lock. This is s/n 510-00230’s frame, note the “00230” electric penciled in the upper right corner for matching it up with its correct cylinder frame after the grip frame was fitted and blued. 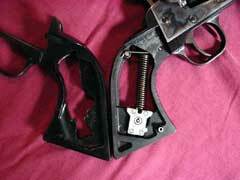 Comparison of the original old model XR3 alloy frame on the left to the “New” Vaquero steel frame on the right. Note the absence of the “V” support in the upper part of the frame where it meets with the cylinder frame and the lack of the support on the back strap of the new model XR3 frame. I imagine that Ruger decided that these “supports” were no longer needed on the steel frames. The “New” Vaquero's black hard rubber checkered grip panel. Close-up view of the “New” Vaquero's trademark Ruger Eagle that is molded into the grip panel. 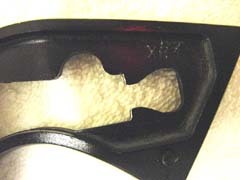 Comparison of the checkering on the original old model XR3 black rubbers on the left versus the “New” Vaquero's on the right. 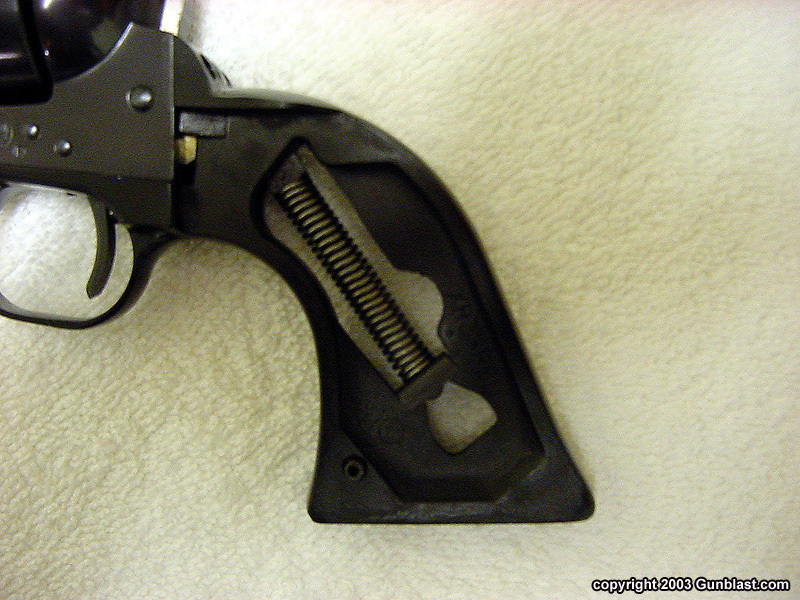 The old grip’s checkering is somewhat coarser. 50th Anniversary .357 Flattop steel XR3 grip frame on the left and an old model XR3 original alloy frame on the right. 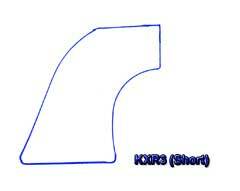 The original XR3 frame has the 50th Anniversary’s grip panel laying on it. 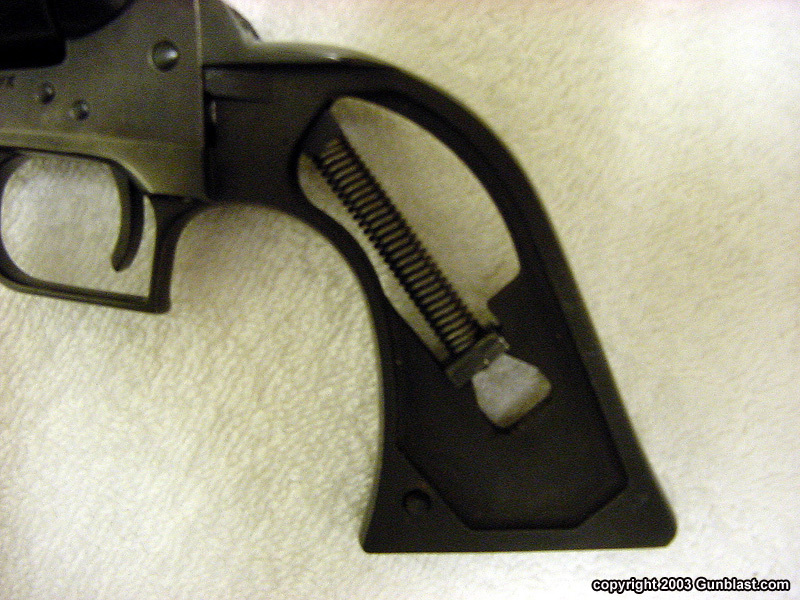 The fit looks good with the exception of no “V” cut in the 50th’s panels, and the different grip locator pin position. 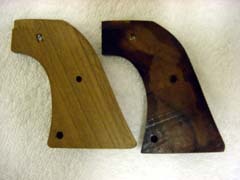 A pair of 50th Anniversary grip panels laying side by side. 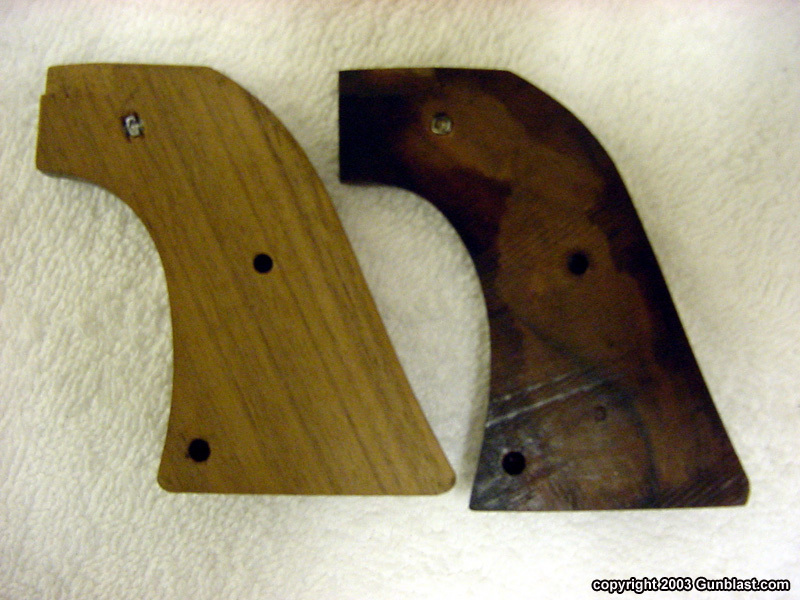 Bottom view comparison of an original .357 Flattop panel on the left versus a 50th Anniversary .357 Flattop panel on the right. Note the sharper ends on the new style panels. 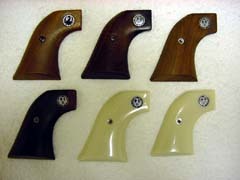 Bearcat grip panel comparison left to right. 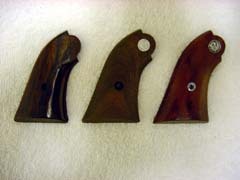 Rosen impregnated Rosewood, oil filled Walnut, Rosewood. Old Model Bearcat frame right side. 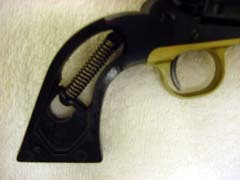 Early Old Model Super Bearcat grip/cylinder frame with brass anodized trigger guard, no mark noted inside of these frames. New model Bearcat grip/cylinder frame. 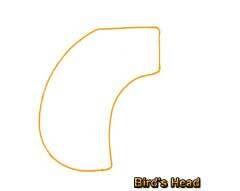 Noted an “A” or “B” inside a circle or square inside the frames examined. 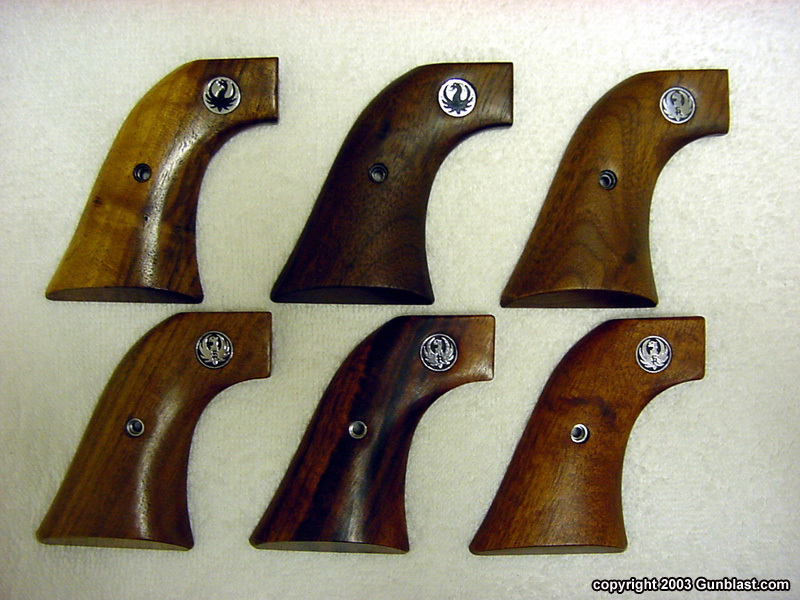 Super Blackhawk grip panels, top row left to right: early varnished walnut w/black eagle, oil filled walnut w/black eagle, oil filled walnut w/flat shiny white eagle. 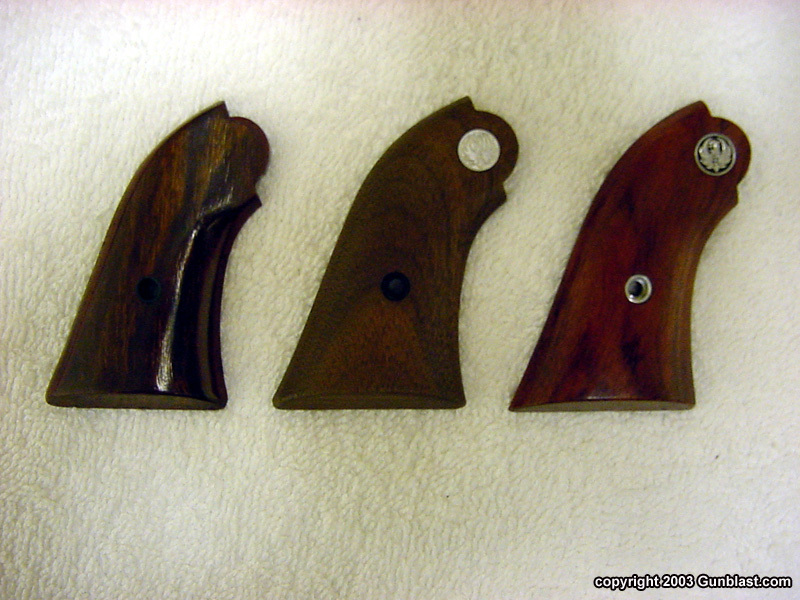 Bottom row left to right: oil filled walnut w/raised eagle – current style eagle, Goncalo Alves w/current eagle, rosewood w/current white eagle. 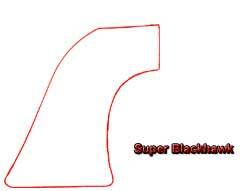 Left side Old Model Super Blackhawk. 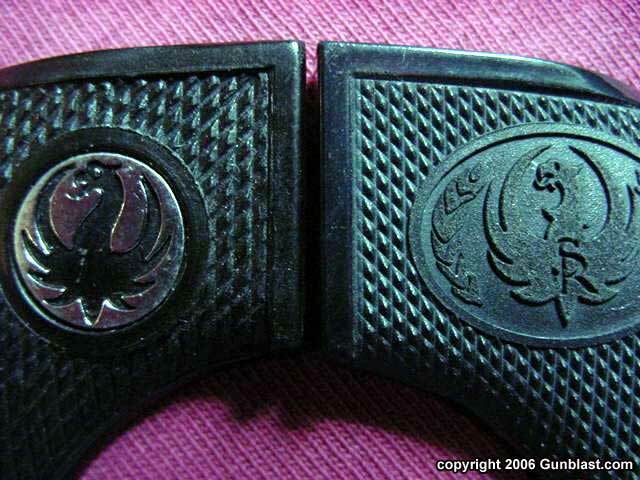 Grip panel comparison: Left is for normal standard Super Blackhawk frame and right is for the rare early Super Blackhawk long frame; note the “c” inside the panel. 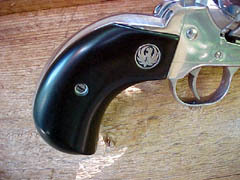 New model blued steel Super Blackhawk; note trigger spring. 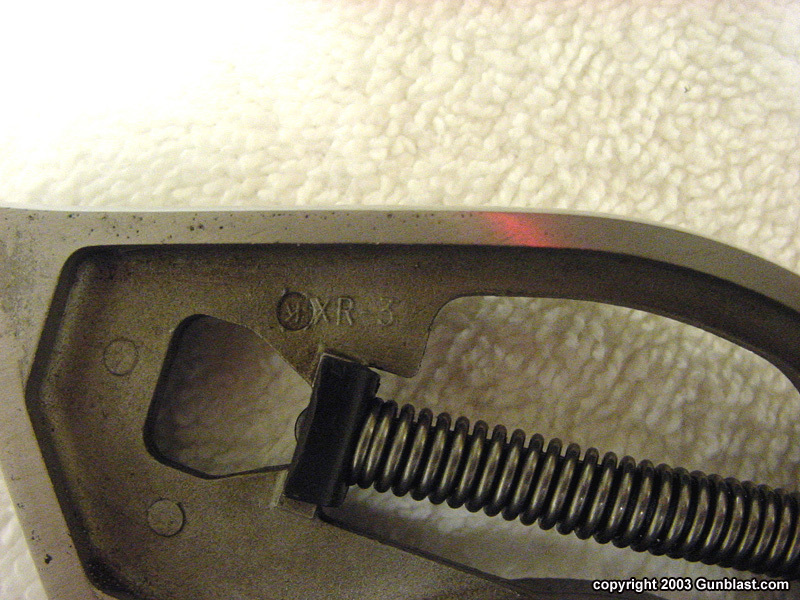 XR3-RED Old Model grip frame, left side view. 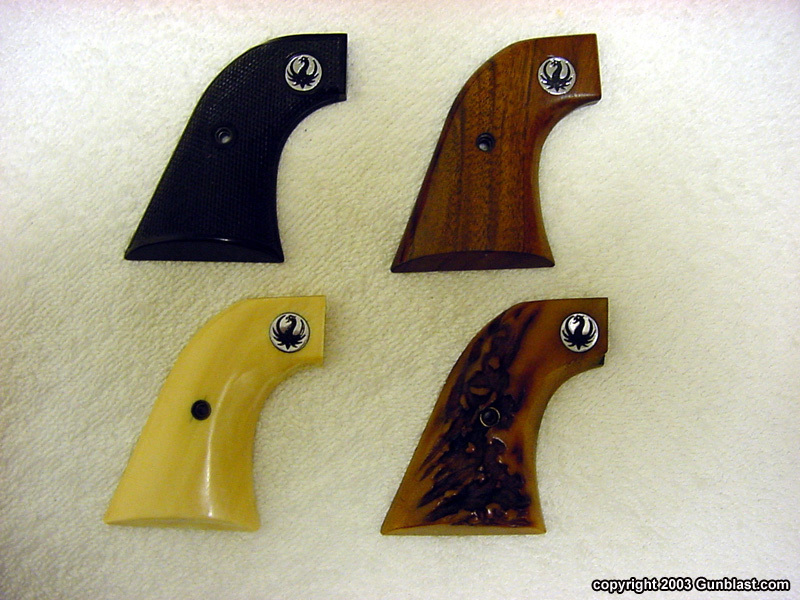 XR3-RED panel comparison: top row left to right – oil filled walnut w/black eagle, oil filled walnut w/flat shiny white eagle, oil filled walnut w/raised white eagle (current style eagle). Bottom row left to right: Rosewood w/current eagle, simulated ivory w/ current eagle, “short” simulated ivory for the short frame Single-Six SSM 32 H&R Magnums. 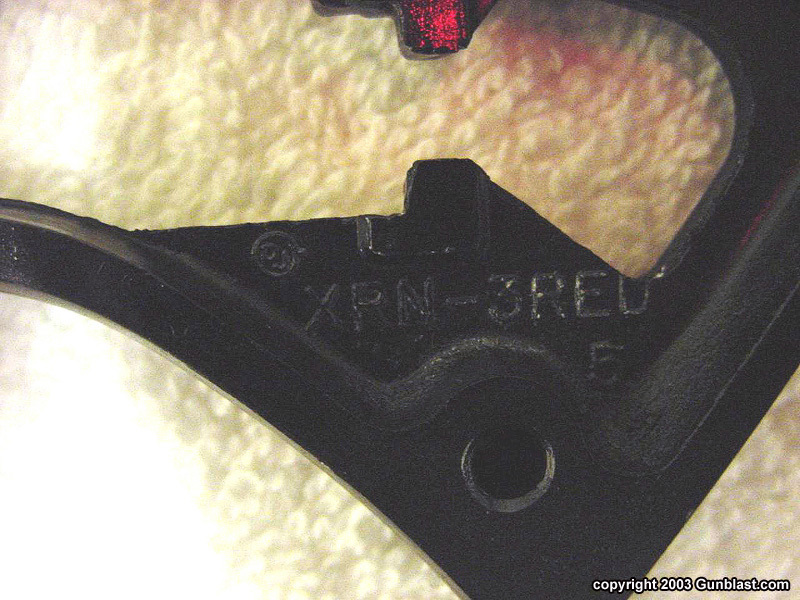 New Model Blackhawk and Single-Six frame, “XRN-3RED” mark inside left side at bottom. 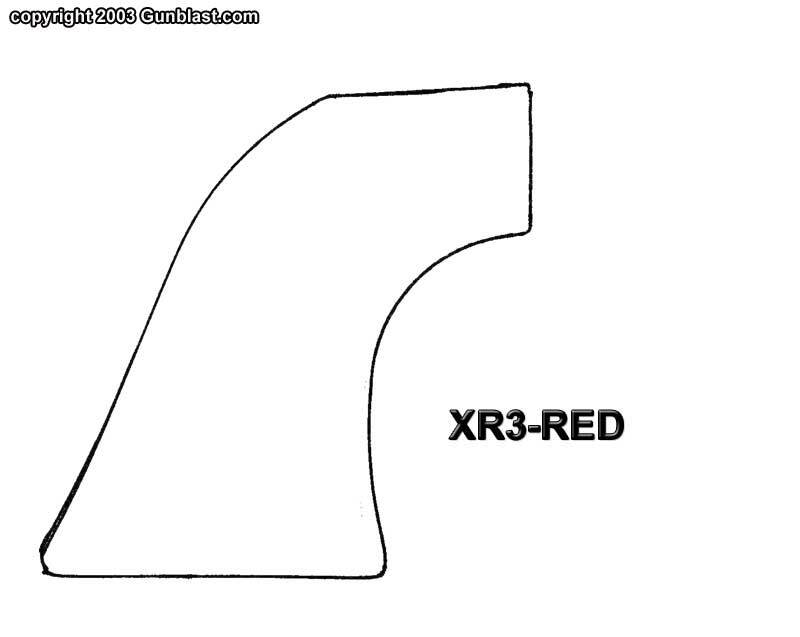 Full view of New Model “XRN-3RED” grip frame. 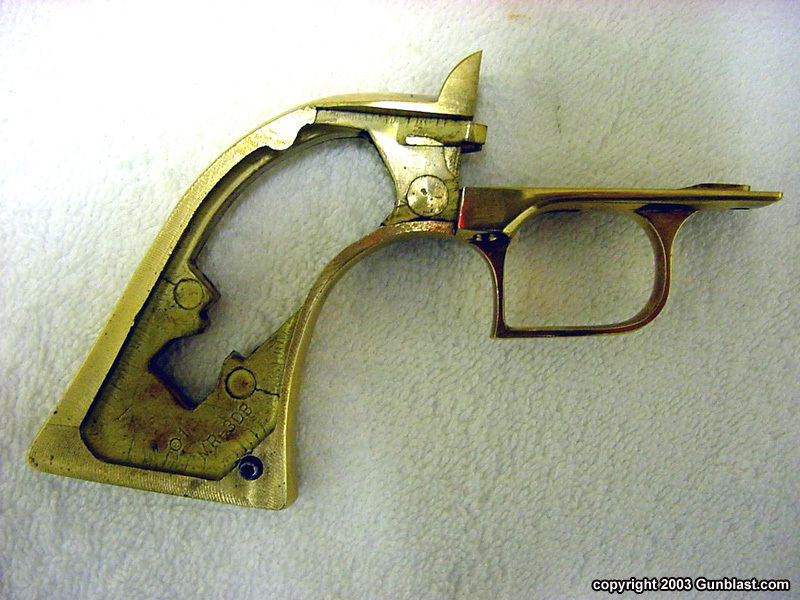 These frames, when made of steel, usually have the last 4 digits of the gun’s serial number electric-penciled inside the grip frame. Factory scrimshawed simulated ivory grip panel. 50th Anniversary Single-Six (New Model) with Cocobolo grip panels and red background eagle. 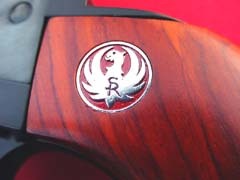 Detail of red background eagle on 50th Anniversary Single-Six. 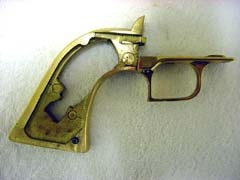 Left side of a factory Brass grip frame, marked “MR-3DB” at bottom front end. 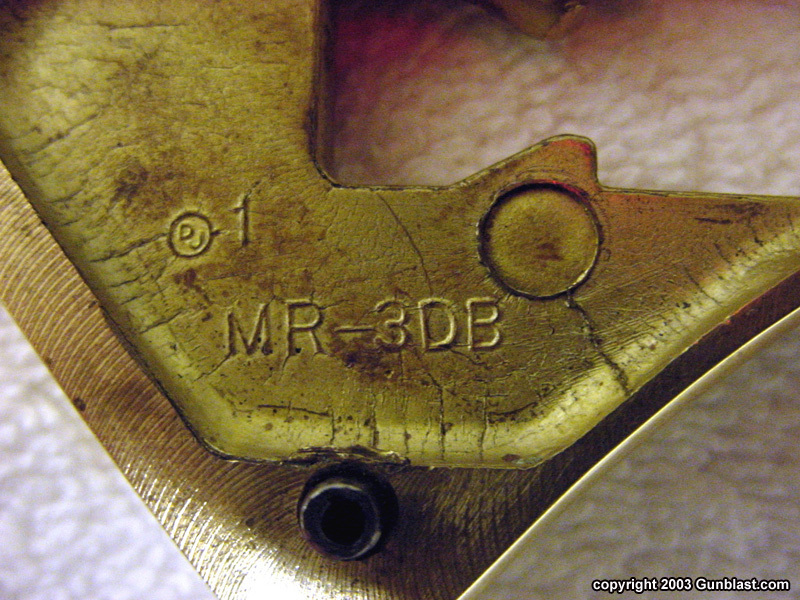 Close up of the Brass frame mark, “MR-3DB”. 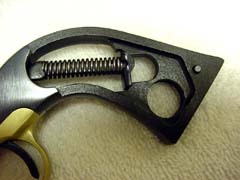 Super Blackhawk brass grip frame. 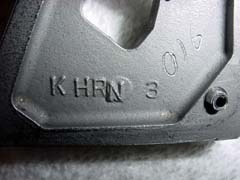 Detail of Old Army stainless steel frame showing the "KXR3" marking. 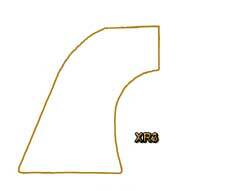 The “K”, which indicates stainless in Ruger terms, is in the little circle in front of the “XR3". 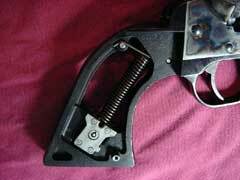 Blued steel Bisley grip frame. 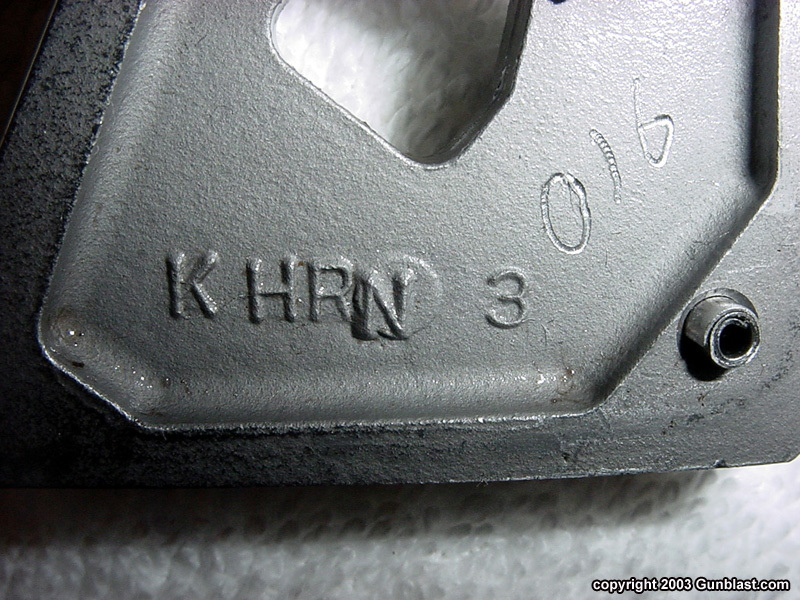 Stainless Hunter frame, right side view, note mark “KHRN”. Detail view of the mark “KHRN” inside the stainless Hunter’s grip frame. 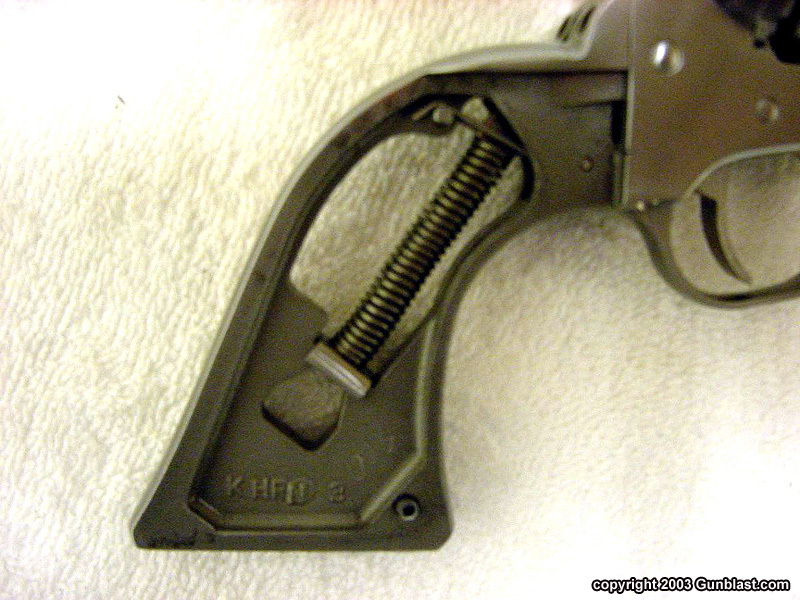 The serial number of the last 3 or 4 digits are put inside these frames, the electric-penciled number “016” is the serial number of this particular gun. Left side view of the “short” grip frame that is used on the Single-Six SSM .32 H&R Magnums. 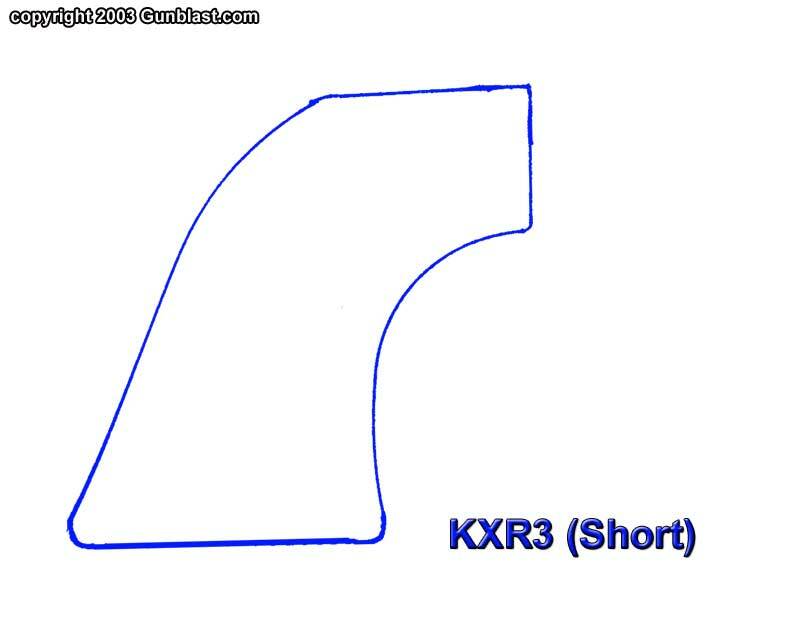 These frames are about ¼” shorter than the normal new model XRN-3RED. Right side of stainless Bird's Head grip frame. Detail of "KMR00307" marking on stainless Bird's Head grip frame. 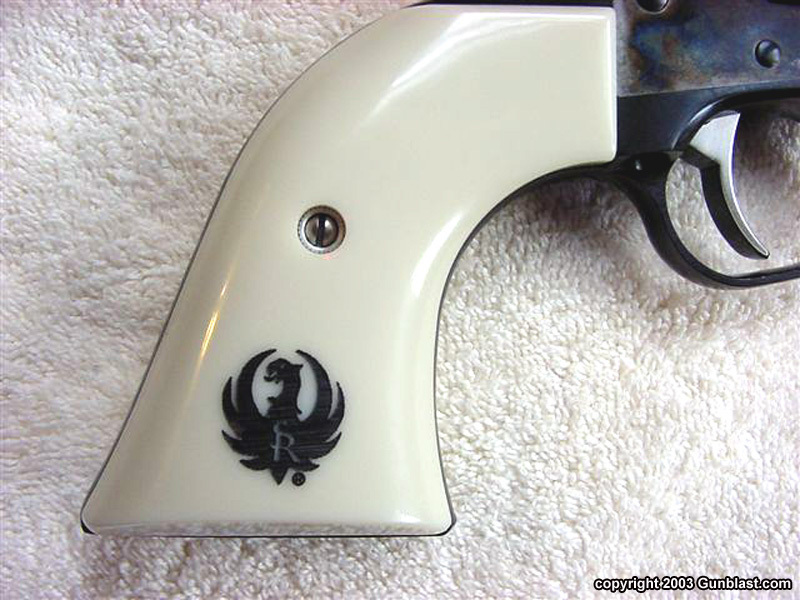 Again, "K" is Ruger's designation for stainless steel. 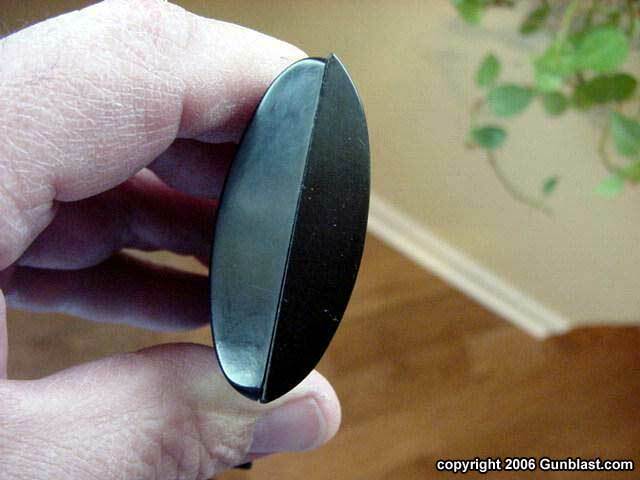 Black Micarta grip panels on stainless Bird's Head. 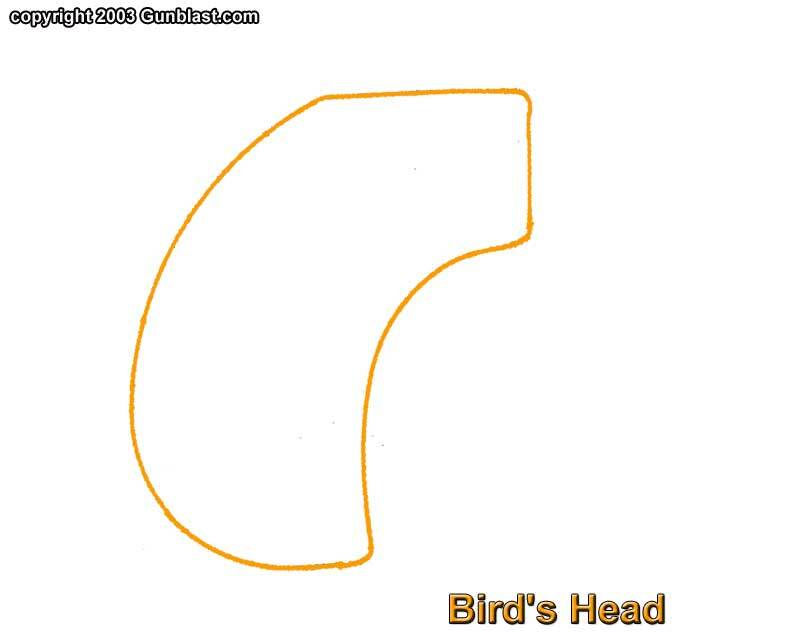 Note: these drawings were prepared by Bill Hamm & Boge Quinn by tracing the right grip panels of models noted. Boge then color-coded and color-keyed the different grip styles and prepared the color overlay drawing as a multi-layer file for easy comparison. 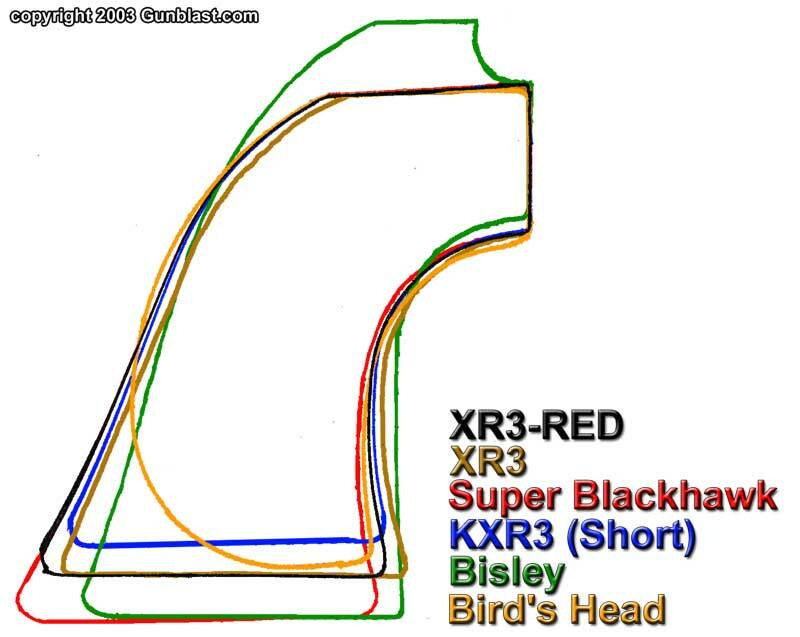 Multi-layer comparison drawing of all the above grip shapes. 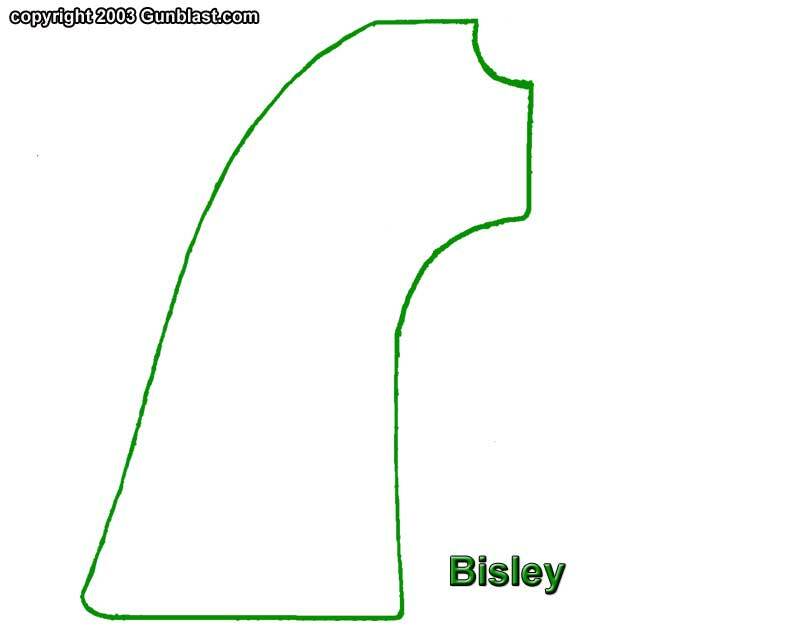 Thanks to the reader who pointed out that my original drawing showed the Bisley grip improperly aligned at the top of the grip frame. As always, we welcome your input. 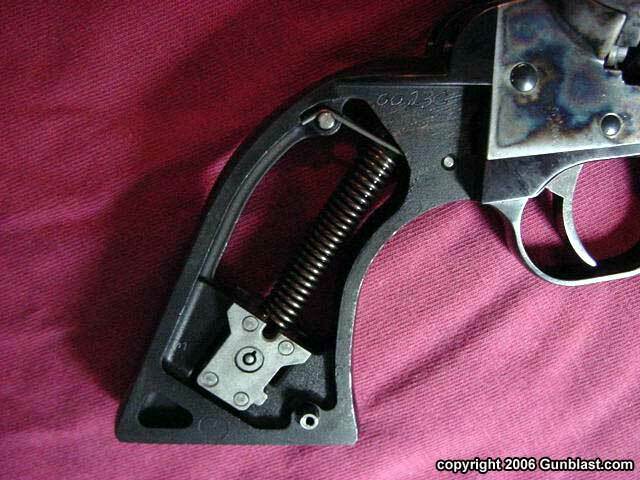 If any of you Ruger collectors spot any inaccuracies or omissions, please feel free to contact us. 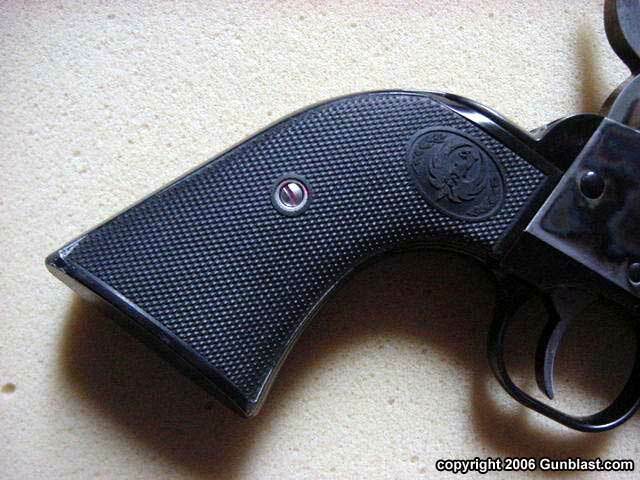 The Ruger Owners & Collectors Society is an active organization for all Ruger Owners, Shooters and Collectors. Annual Membership includes a ROCS Logo Brassard, the latest Digest Magazine and an invitation to ROCS events. There will be two Digest magazines published every year. For more information and to apply for annual membership please visit www.Rugersociety.com on the web or write to ROCS, P. O. Box 1026, Killen, AL 35645-1026. We welcome you!! 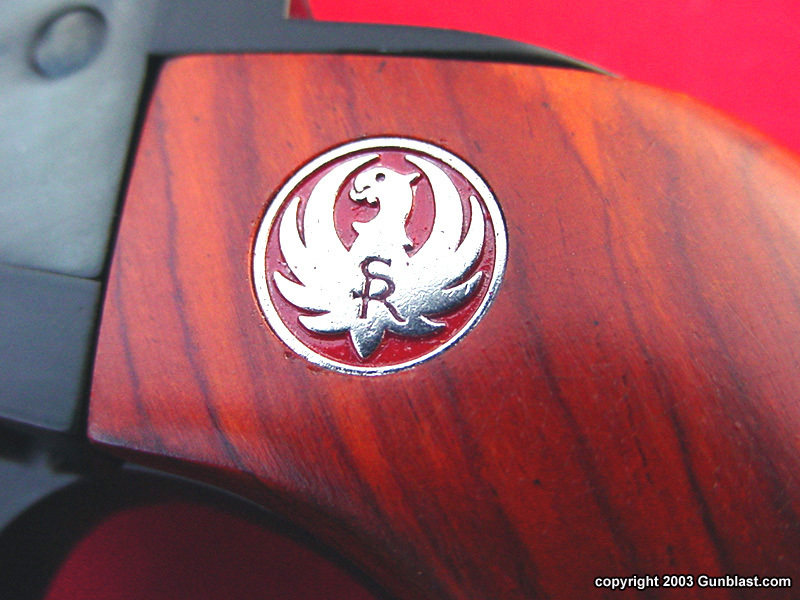 The Red Eagle News Exchange is a quarterly publication filled with new information, updates, and articles about collecting Ruger firearms and memorabilia. This is an excellent resource for the Ruger collector and/or enthusiast, and the wealth of information sent to new subscribers as a free gift with a paid annual subscription is alone well worth the money. Highly recommended. For more information or to subscribe, write Red Eagle News Exchange (Chad Hiddleson - Editor), 1945 Clover Avenue, Perry, IA 50220, or call (515) 465-2057.